I ended up going to the 5 o'clock Circo Luci show, so I was in Huis Ten Bosch after sunset. To be honest, I expected more from the show, but I might very well be unfairly comparing it to the Cirque du Soleil! There was one amazing performer (I don't think I've ever seen such an enormous and man who was so "cut" before!) who did some really cool things with and in both a giant ring and later an open metal cube. At one point, he had the cube (which was as tall as he was) tipped up on one of its corners and was spinning it on his forehead! It didn't even look real. The costumes of the "extras" were quite bizarre, but were entertaining. Afterwards I wandered around a little more, grabbed a hot chai tea latte from the man selling them in the VW bus (again - random, but cute! ), and enjoyed the town as it began to wink on at twilight. It's cherry ("sakura") blossom time! Actually, since it's been so "warm" this winter, the sakura bloomed early, and they're almost past their prime here in Isahaya, but I'm sure the "hanami" (cherry blossom viewing parties) will be just starting in the rest of Japan. Since I'm so used to seeing trees that stay the same year round in South Florida, it's been quite lovely to see the changing of seasons and foliage here. The flowers are like little surprise presents that pop open when I ride by! Hope everyone's sufficiently recovered from the festivities! So I know you're all wondering "how the Japanese do St. Patrick's Day"...well...they don't, really, but thanks to a gaijin from Ireland (aptly even named Patrick!) who organized a gig at the Spot in Omura, I had a small dose of this holiday. Thanks to my Texas friend, Cara, I even had a fabulous get up! Thanks again for the shirt, C, it was a big hit! 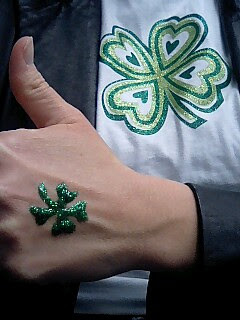 I even brought some green glitter paint and we had a good time painting shamrocks and the like (ever the art teacher, yo!). I hopped the train up to Omura, and hung out at the tabe/nomihodai (all you can eat/drink) at the Spot till about 11, when I had to catch the train back (had to go to a school function on Sunday morning). I'm not into most things alchohol lately, but it was entertaining watching the rounds of Irish Car Bombs, and, yes, there was green beer. I got on Patrick's case since there was no Irish music to be heard (I should've just brought mine - but you'd think with at least two real live Irishmen...). There was also a TON of smoke - I keep forgetting that Japan isn't smoke free anywhere - gotta say I REEEEally miss that about the States. Anyway, the best part of St. Pat's here was actually the day before, when we serenaded Reiko san (whose birthday is March 17) with "When Irish Eyes are Smiling". Dad sent over a plush leprechaun that played the song, and so I rallied the troops and we sang to Reiko san after she opened her present. Kyoto sensei (the one who's in the birthday photo with me) should really consider karaoke as a second career! On Tuesday, the ichinensei at Isahaya Commercial High School (Kansho - the one I visited when I came here 2 years ago) hosted an International Day. We had a blast with games, skits, snacks, and chats. Here I am (in character) with my fabulous group the PPP (which has something to do with pink, but I was never told what the rest of it meant). Their English was very good, so I hope that you enjoy their comments (which they will undoubtedly be making soon!) below. Unlike most places in the States, the students here test to get into high school. One test. One shot. It took them the better part of two days, and from what I gathered (mind you, I'm still flying blind here most of the time!) included various listening, writing, and interview sections on all the subjects. On Thursday Kanko posted the test results, and here you see the happy folks who just found out they're going to be the new Isahaya Koko ichinensei in as of April 9. I didn't see too many cameras, but how many people can you find taking a photo with their keitai? I seem to be experiencing technical difficulties and can't upload any photos...I'll post again when I can! Yea! I finally got to see the family that hosted me for a night when I visited in 2004. Motoko Honda (center) and her husband live in Konagai, a town part of Isahaya city, about 45 minutes from where I live in Nishi Isahaya (that, of course is my car - it's probably at least 3 hours by bike!). Motoko san's friend, Chieko san and Takako sensei, my JTE from Takaki Bunko, and I enjoyed a lovely lunch at Motoko san's house one Saturday. What feast! We even had some fish that her brother had caught in the bay. Since my Japanese is not even as good as Motoko san's and Chieko san's English, we were very glad Takako san was there - though I'm sure she was tired after translating most of the day! I know! I know! It's a......? I have to type quickly, as my computer's almost outta juice. Pop quiz: What is this object? Sorry! I've been a little busy the past couple of days! After the graduation ceremony, all the students went back to their homerooms and it was there that they received their diplomas from their homeroom teachers. It seems that they were then allowed to do little speeches to their parents, teachers, and classmates, and one of the classes was in there for almost 3 hours! It was very emotional (and I didn't even really understand what they were saying!). Outside, however, the ichi and ninensei "kohai" were a bit more celebratory while waiting for their sannensei "senpai". From what I understand, the older students are responsible to be "senpai" to the younger students; they're leaders and mentors, and it's taken quite seriously. So, after graduation, each club waited outside to cheer their senpai members in various ways. Most of them had made boards with the senpai's name and notes to them from all the kohai, though the band members signed the top of a timpani drum instead! In the photos you see the tennis team donning cute "boshi" (hats), but most of the others wore either their team or school uniform. These students are soooo serious all the time; it was refreshing to see them so excited and happy with each other! Just another classic Japanese moment! The Kanko staff had an enkai (formal Japanese dinner party) Friday night to celebrate the graduation and the track coach's national award (I made a post around Christmas - his team placed 5th in the nation on 12/24). HOWEVER, after my very genki kyoto sensei (asst. principal, pictured here) heard it was my birthday, he made everyone stop and sing "Happy Birthday" (in English!). As the rousing rendition was coming to a close, he swooped up one of the flowers from the arrangement in the room and presented it to me. I had a pretty low-key time after that - just met up with some of the other Isahaya ALTs at Bar Mole in the Arcade here (the owner plays great jazz music and is the father of one of my students). Called it an early night, because as you'll see, the day after my birthday was a busy one! Today was a very happy day here at Kanko! This Japanese graduation ceremony was quite different than what I'm used to in the US, but, it seemed fitting for here. First, all the students came to school as usual, an in uniform. Everyone went to the gym, and for the most part, even with over a 1000 people, unless we were singing, it was quiet. There was no "walking across the stage" either. Kocho sensei (the principal, in the photo here) stood at the podium, homeroom teachers called students' names, the students said "Hai", stood, and bowed to Kocho sensei (and he to them). Only 3 speeches - kocho sensei, a ninensei, and a sannensei. The band and chorus (several hundred students) did several numbers, and things wrapped up with the Ouendan ('cheer' team) performance. I'll show you the "after" grad festivities later. Now I need to wrestle with foreign ingredients and a Japanese oven to try to make my birthday cake for tomorrow!